At some point, just about everyone who does laundry has wondered how to clean grimy pillowcases. Parents of teens are all-too-familiar with how their hormones lead to greasy hair and skin that stains their pillows. Those who work outdoors find themselves in the same boat. Pillowcases also get grimy when someone doesn’t remove their makeup before going to bed. 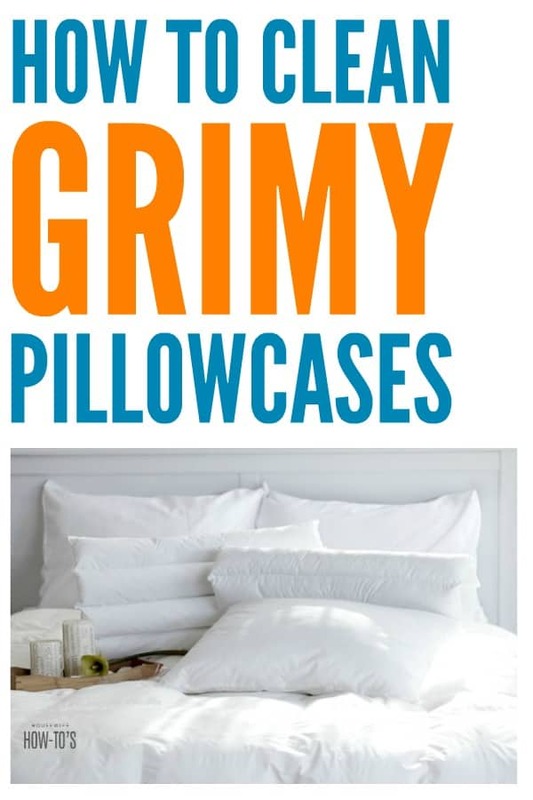 The thing is, grimy pillowcases tend to be smelly ones, too. Who wants to lay their head on a pillow that stinks? Let’s fix that. To get the grime out, you need to loosen the chemical bonds between the greasy, waxy substance and the pillowcase fabric’s fibers. 1. Fill a sink basin with very hot water then add 1/4 cup Dawn Original dish detergent (Fairy or Sunlight in the UK), and 1 cup baking soda. Swirl to combine then add the pillowcases. 2. If you have a scrub board, use it. Otherwise, grab a hunk of the pillowcase in each hand and scrub the fabric against itself. Switch positions and repeat until you’ve given it a good allover rub. 3. Switch the pillowcases to the other sink basin and drain the one you’ve been using. Refill the sink with hot water and add more Dawn. Put the pillowcases back in and let them soak for 1-2 hours (or even overnight) then rinse thoroughly in HOT water until the water runs clear. 4. Now, put them through a regular wash cycle on HOT water, using your usual detergent, and dry them. You may not be able to talk your family into showering every night before bed, but you can still take a few steps to keep your pillowcases from getting grimy again. First, skip the fabric softeners and dryer sheets. These work by coating fabric with a very light layer of wax or grease, both of which attract and hold onto skin and hair oils. Second, use vinegar plus an oxygenated bleach (like OxiClean) when washing your linens. Chlorine bleach doesn’t remove grease well and should never be mixed with vinegar! Also, remember to wash your bed linens in HOT water every time. 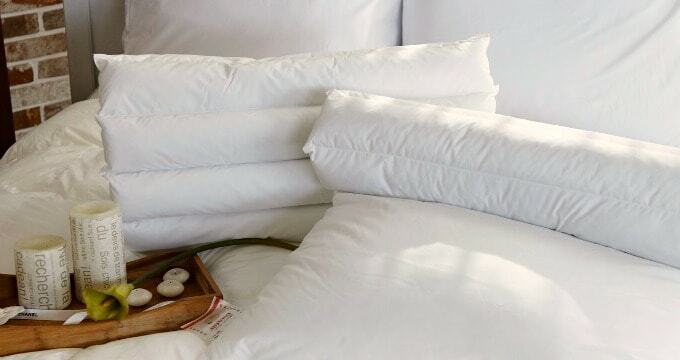 It only takes a few minutes to clean grimy pillowcases, and a few simple steps to keep them from getting grimy again. Why not tackle yours today? Can this be laundered in cold water as the instructions state???? I’m sorry, I don’t know what item you’re asking about. I have inherited beautiful old linens but they are yellow in some ares especially the pillowcases. I have laid them on the grass in the sun, my mother’s way especially for cloth baby bibs n diapers.) but the yellow comes back. Plus they have that waxy smell. They seem very strong or not easily torn. They are all white. I’m very reluctant to offer any tips on cleaning something as precious as heirloom linens, E.A. You might find some good info in this video from Martha Stewart about cleaning vintage linens, though. Best of luck! What type of vinegar do you use? White vinegar? That’s what I use, yes. Will this work if you have used bleach on these pillows before ? It should, Dorothy, provided you’ve since laundered and dried them. Thank you so much for this post about cleaning grimy pillow cases!! This WORKS….yay!! I tried it on 3 pillow cases today and soaked them in the Dawn and baking soda, wow it really got the grimies out. I boiled water on the stove so it would be really hot and poured it into a basin with everything. Now I have some more pillowcases to clean. This may not solve the world problems, but it solves one of mine…ha ha. I’m happy to have helped, Patricia! I’m happy to have helped, Lonnie! It should work but, honestly, I fail to see what is so time-consuming about scrubbing with a brush, then filling a sink with hot soapy water and dumping pillowcases in so they can sit overnight. Surely your two small kiddos can spare you for three minutes. Some have laughed at me for my inventory of vinegar, but when I explain all the money saving tips that come along with the product, they find themselves becoming one of the club….LOL. By the way, love the new site design. I’s easy to navigate and very pleasing to the eye! I have shelves and shelves of vinegar, too. The grocery store clerk always look at me oddly when I buy an entire cartful when it’s on sale…not that vinegar’s ever expensive, but if I can get it at 50 cents for a gallon, I’m stockpiling! Thank you for the feedback on the new site design. I’m very, very happy with it, and it’s so easy to add/change stuff if I need to. Love that! Vinegar is truly amazing. It’s odd that here in America we’ve been brainwashed to believe we must use harsh chemicals to get our home and laundry truly clean. Our grandparents didn’t have “Scrubbing Bubbles” or “Mop & Glo” but we know they were excellent housekeepers. They used vinegar! This cannot be shared often enough and yes, prevention is as important as the cure in this case. Vinegar works miracles in our household and this is an excellent tutorial on the home economics of laundry. Aw, did someone pee in your bowl of Wheaties this morning?